What is Rapid Heat and Cool with Gas Assist? It is a process where we heat the tool up while injection and cool it down rapidly during cooling while concurrently packing out the part for no sink utilizing a nitrogen gas. 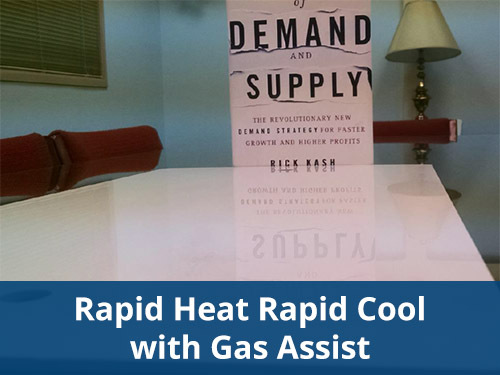 Our Rapid Heat-Rapid Cool with Gas Assist process achieves a Class A type surface without sink. 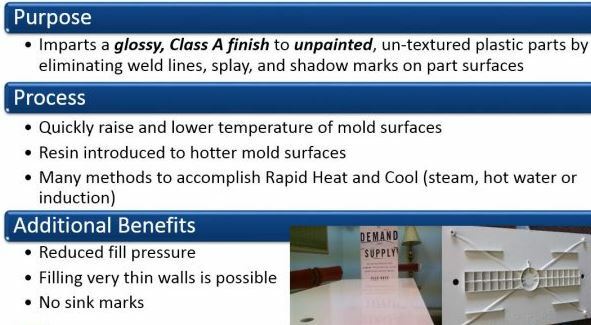 Adding the Heat and Cool portion to the molding of the part with Gas Assist can take your designs to the next level and eliminate paint! We can also achieve this with glass filled materials. There are many methods to achieve the heating and cooling of the tool. Some of those methods are: Hot Oil, Steam, High-pressure hot water and Induction. Based on the volume of your application we can help to determine which method is right for your situation. 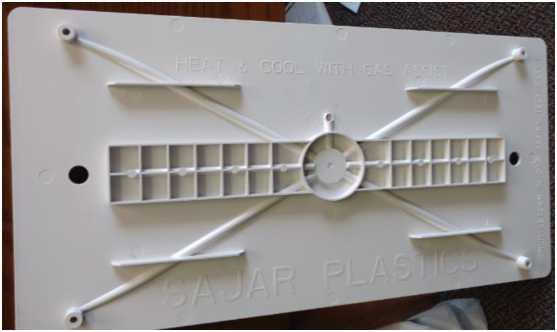 As the world leader in gas-assisted plastic injection molding, Sajar Plastics has extensive molding capabilities to meet the diverse needs of our customers as well as empower designers to push the envelope on design. 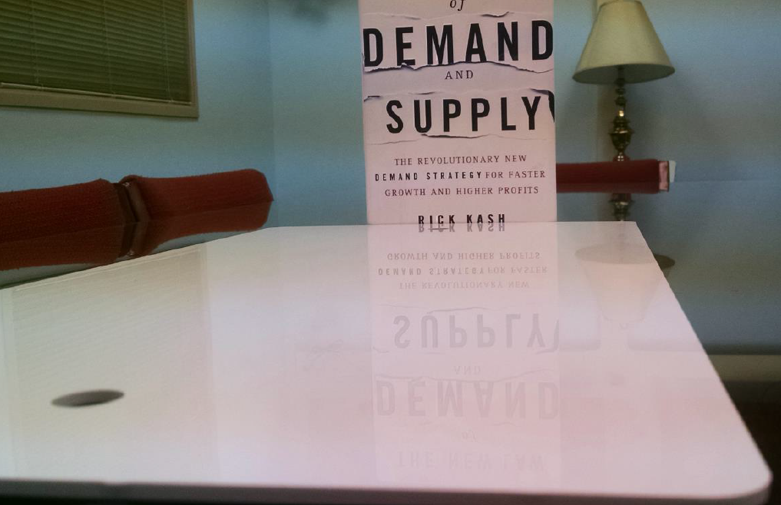 What are competition fears in a design, we embrace and conquer. 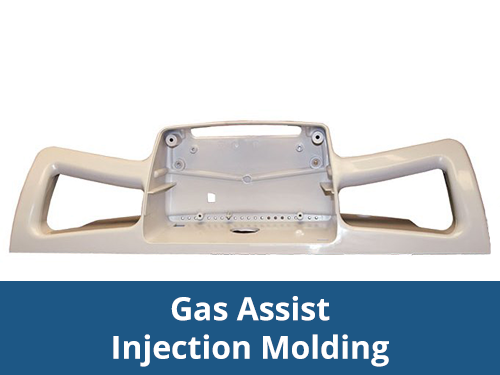 Understanding how gas assist can help you will realize the consolidation of the number of parts in your design; have improved tolerances and fit; and allow you to do things you never thought possible with your old way of thinking. The gas assist process is one that packs out the plastic part with Nitrogen gas instead of plastic. 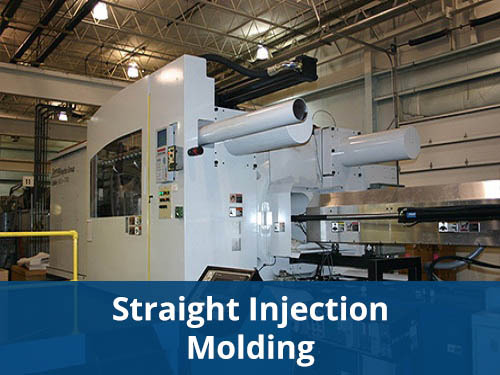 This allows you to break almost all of the straight injection molding rules since gas penetrates the part to pack it out. Now you can have very tall bosses with draft, bosses attached to the side walls, no core outs on features to reduce undercuts/slides, thick sections, and many other design advantages without worrying about sink marks on the show surfaces. Packing with gas also allows you to reduce the clamping tonnage of the machine required since we typically do not exceed 4000 PSI for packing pressures. To determine approximately the tonnage required for gas assist take the projected area times ~1. For straight injection take the projected area times 3.5- 4.5 depending on the viscosity. 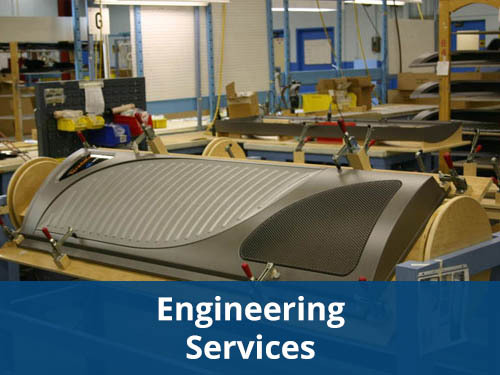 We offer both internal and external gas-assisted injection molding which allows us to create a myriad of complex part geometries not previously achievable by injection molding. We may also sometimes convert a troubled existing injection molded tool to a gas assist tool and eliminate sink from the part. Our growing customer base includes OEM producers of retail kiosks that provide automated services, laboratory and diagnostic equipment designers, medical equipment manufacturers, and large office equipment companies. 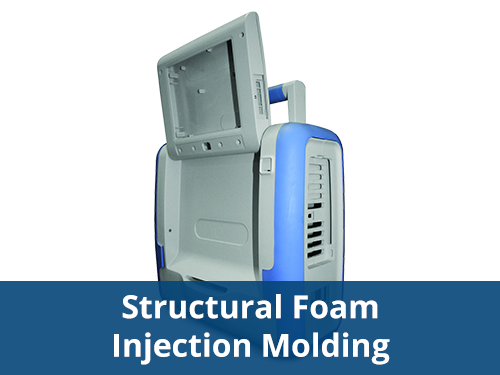 In addition to gas assisted molding, traditional injection molding and structural foam molding are available. 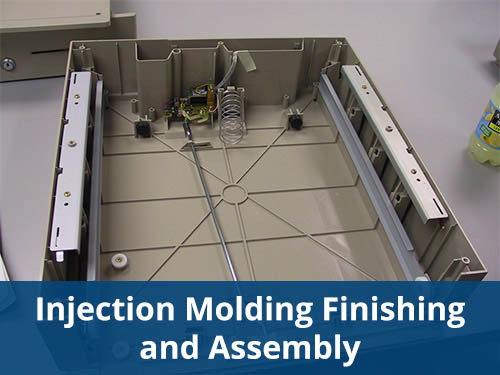 Value added services including painting, inserting, printing, assembly and packaging provide customers with a single source for turnkey injection molded parts.